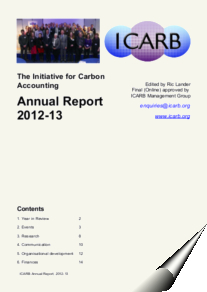 ICARB has published its latest annual review of its activities, covering April 2012-March 2013. Establishment of accounting process for energy generation. Recognised progress on tourism accounting with Crichton Carbon Centre and partners. Ground-breaking synergies on land-use accounting with Forestry Commission. Partnerships in place to develop new city and community accounting tools into 2013-14. 150+ experts participating in our events with international conference becoming established ‘go-to event’ for carbon accounting developments. Rapidly growing following on our new social media channels and over 3000 mailings delivered to our network. New website reaching visitors from 62 countries. You can download the report as a PDF by clicking here. This entry was posted in Carbon News, Top news on May 27, 2013 by Ric.